- What's gone wrong for the Calgary Flames? The NHL will unveil its heavily hyped Top 100 list of the league's greatest players this weekend as part of the all-star festivities in Los Angeles. The list won't be ranked, but it's still sure to cause some controversy as fans pour over who makes the cut and who gets snubbed. In the leadup to the announcement, there's been some confusion over how many active players have been included. Initial reports suggested there were only six, which seemed far too low. Later, it was suggested that there may be six of this year's all-stars on the list, in addition to several other active players who weren't taking part in the weekend's events. That seemed to make more sense, although the league hasn't confirmed anything. Sorting out which active players to include is harder than it might seem, and I found that out firsthand. After criticizing the league for chickening out on doing a ranked list, I was approached about working on one of my own. 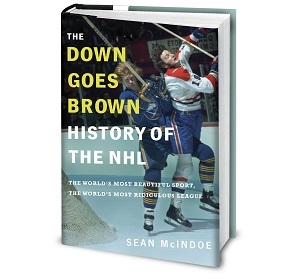 The end result was an e-book, co-authored with Greg Wyshynski and Dave Lozo, that was released this week. Here's what I learned: This stuff is harder than it looks. And having been through the process of pulling together a Top 100, I can tell you that figuring out where to slot in active players may be the toughest calls of all. Remember, you're comparing guys who are still in mid-career to other players' finished products. Sometimes, it's easy. Sidney Crosby and Alex Ovechkin were no-brainers for the Top 25, and veterans like Jaromir Jagr, Jarome Iginla and Joe Thornton made the list without much argument. But other guys turned out to be more contentious debates. Here are the five toughest calls among active players that we ran into, and what we ended up doing with them. When we built our list, we were looking at two key questions: Was the player ever considered one of the best in the league, and were they able to consistently produce over the course of a long career? The Sedins check both boxes. Both have won an Art Ross. Both were postseason all-stars on multiple occasions. Henrik won a Hart Trophy in 2010, and you could make a strong case that Daniel should have in 2011 (he finished second to Corey Perry in a close vote). And both have been consistent producers for over a decade. So sure, they're great players. But top 100? Henrik just hit the 1,000-point milestone and Daniel will get there soon, but lots of guys have reached that mark. Competition for a spot on the list was tight, as you'd expect given we're dealing with 100 years of history. For example, we were surprised that we couldn't find room for names like Mike Modano or Doug Gilmour, both of whom will probably top the Sedins by over 300 points when all is said and done. True, the twins played their entire careers in a lower-scoring era than many of the guys ahead of them on the all-time scoring list. But even factoring that in, they're far from a slam dunk. Our call: They both made the list. But just barely. The Sedins were a tough call, but at least they're closing in on the end of their careers. Players like Price are even trickier, because we don't have any idea where they'll wind up. The Canadiens' goalie hasn't even turned 30 yet, so there's a lot of runway left here. That said, his resume is already impressive. He won the Hart Trophy, which few goaltenders have managed to do. Of course, so did Jose Theodore, and he's not on anybody's Top 100 list. Price is no Theodore – settle down, Habs fans – and there are goaltenders with shorter careers than his who made our list easily. But those guys won multiple Vezinas. Price hasn't… yet. The NHL all-star game is this weekend, and the rosters are… well, they’re fine. Maybe a few names that are mild surprises, sure, and there are probably too many Blackhawks, but there always are. Overall, the league did a reasonably good job of filling out the rosters this year. To be clear, there’s really no such thing as a bad all-star. If you’re on the all-star team, you can’t be all that bad. Even if you really shouldn’t be there, you’re still a halfway-decent hockey player. That works. Today, let's go through some of the more questionable picks over the years and see if we can put together a full roster of the oddest all-star picks in NHL history. • The late replacement: Somebody else was supposed to go, they couldn't make it, and you were available. • The one-per-team rule: Most years, the NHL insists on having each team represented by at least one player. When a team is really bad, that can lead to some interesting choices. • The ballot-box stuffing: Somebody gets voted in by an enthusiastic fan base and/or a small Baltic country. • The weird format: When it's the traditional conference-vs.-conference or the current division-vs.-division format, things tend to go OK. When the NHL tried to more creative, things got weird. • The Crazy Mike Milbury: We'll get to it. One important note: For this team, we're not counting commissioner picks. For a few years back in the ’90s, the commissioner could add a player or two to each roster after they were finalized. It was a way to recognize respected veterans whose careers were coming to a close, and it would feel wrong to pick on those guys. So that's why there's no Brad Marsh on our roster. With that in mind, let's meet our team. Qualifications: The popular veteran (and current beloved broadcaster) had enjoyed a long career, first in the WHA and then in the NHL. But he wasn't exactly anyone's idea of an all-star, posting a career GAA north of 4.00, which wasn't great even in the offensive 1980s. When the Canucks acquired him in February, 1983, it was to serve as a backup to starter Richard Brodeur. Brodeur was supposed to be the Canucks' representative. That would have been an iffy pick in its own right, but somebody from Vancouver had to go and Brodeur was having a decent season. But he got hurt a few days before the game, meaning the league needed another Vancouver goalie to take his place. Garrett was the only option, even though he'd been a Canuck for less than a week and had only six wins on the year. As a side note, Garrett played well in the game. In fact, legend has it that he had been voted MVP midway through the third. But then Wayne Gretzky scored four times, the vote was changed, and Garrett lost out on a free car. Qualifications: After a few years of steady work in Hartford, Sidorkiewicz wound up in Ottawa for the Senators' first season. Playing behind one of the worst teams in NHL history, he got shelled every night. When the all-star break rolled around, he had a record of 4-32-3 and a goals-against average of 4.40. Hey, somebody from Ottawa had to go. Most expected it be someone like Norm MacIver or Sylvain Turgeon. But instead it was Sidorkiewicz, a surprise pick that left bigger names like Ron Hextall and Tom Barrasso at home. Hey, think of it this way – who better to suit up in a game where nobody plays defence than a goalie for a terrible expansion team? Qualifications: He was midway through the only 20-win season of his career, and Martin Brodeur was still a year away from arriving as a full-time NHLer. Category: No idea. This is the only pick on our roster where not one of the standard categories seem to apply. It's fair to say that 1993 was a weird year for goalies, as Billington joins Sidorkiewicz on the Wales squad. Fun fact: A few months later, they'd be traded for each other. Later this week, the NHL will unveil it's list of the Top 100 players in league history. But they're not actually ranking it, which seems to take half the fun out of the whole thing. Well, I can't do much about the loser point or low-scoring games or most of the other things I complain about. But with the help of a few friends, I can do something about this. 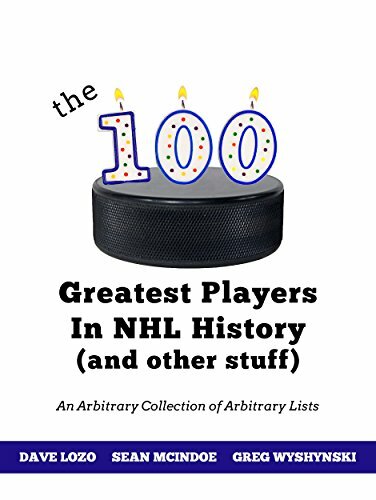 Biscuits co-host Dave Lozo and I have teamed with Puck Daddy's Greg Wyshynski to present The 100 Greatest Player in NHL History (And Other Stuff): An Arbitrary Collection of Arbitrary Lists. It's an ebook that you can purchase from Amazon and iTunes, with other sources to come. Our Top 100, counted down from 100 to 1. Writeups for each player -- you're pretty much guaranteed to learn something you didn't know about hockey history. Other arbitrary lists, including Gary Bettman's worst decisions, and my predictions for what the NHL will look like when it turns 125. A dissenter's section, in which the three of us rip into each other's worst rankings. Your personal favorite player, who is guaranteed to not be ranked high enough. The list Dave Lozo was born to write: 100 NHL players whose names sound vaguely dirty. Once you own it, feel free to contact Dave, Greg and I directly to tell us which specific rankings were our biggest mistakes. And as always, thanks for your continued support. This was a fun project to work on, and I hope you enjoy it. We knew this was going to be a weird year for the St. Louis Blues. Their coach quit, but still stuck around for one more year. Next year’s coach has already been hired. They traded their best goaltender to a conference rival, but didn’t move the defenceman we all assumed would be moved. So sure, nobody went into this season thinking it was business as usual in St. Louis. But we all thought they’d be good, right? Maybe not win-the-division good, or another-conference-final-appearance good. But they’d be in the mix, at least. At a bare minimum, they’d definitely be in the playoffs. And early on, it looked like we'd all be right. Over the season's first half, the Blues were just fine, even if they looked like they weren't quite hitting on all cylinders. That may even have been a positive; after years of following up solid regular seasons with disappointing playoffs, maybe the Blues had learned to pace themselves, the way the Blackhawks and Kings always seem to. Or maybe not. Maybe the Blues aren't a good team after all. They sure haven't looked like one recently. After dropping a 5–3 decision to the Jets on Saturday, the Blues have now lost three straight. They've won just five of 12 since the Christmas break. And since a three-game win streak that had them at 14-7-3 on Dec. 1, they've only managed to string together back-to-back wins once. So what's the problem? These days, the big issue is goaltending, as Jake Allen seems to be imploding in his first year as undisputed starter. The Blues have lost his last four starts and 10 of his last 14, and he's given up three goals or more in six of seven. He hasn't made it through a full game since Jan. 5, and things got so bad on Thursday that he was pulled twice in the same game. That was the last we've seen of Allen; the Blues took the highly unusual step of leaving him behind when they headed to Winnipeg, citing a need to "get him unlocked." The team insists that Allen is still their guy, but it's clear that his current struggles aren't just a typical cold streak. It all adds up to a Blues team that's just barely clinging to a Western wild-card spot, just one point up on the ninth-place Canucks. Even the Predators, all but written off after an awful first half, passed them over the weekend, bumping them out of the Central's top three. Of course, that's led to speculation that the team might try to kill two birds with one stone by moving Shattenkirk for a goalie; more than a few observers have wondered if a Ben Bishop deal could be a fit. But there are other options, including shaking up the lineup or even pulling the trigger on Ken Hitchcock a few months early. Or maybe they stand pat, turn things around and get back into the race. That's certainly a possibility. But the schedule won't do them any favors heading into the all-star break; they'll visit two of the best teams in the league this week, with stops in Pittsburgh tomorrow and Minnesota on Thursday. 5. San Jose Sharks (29-16-2, +16 true goals differential*): They make their first appearance in the top five since early December thanks to four straight wins. 4. Columbus Blue Jackets (32-10-4, +48): Yesterday's 7–6 win over the Senators was all sorts of fun. But more importantly, they may have dodged a bullet when Zach Werenski left the game after being hit with a shot. It looked bad, but he returned later in the period. - With Henrik Lundqvist struggling, are the Rangers a team in crisis? If you spend much time reading about sports online, you’ve no doubt encountered The Players’ Tribune, a website that features articles written by athletes. That unique hook, paired with a smart social media strategy, means that the site’s content tends to be unavoidable. That’s never more true that when the site produces its signature piece: the “Letter To My Younger Self”, in which an athlete sits down to pen some words of wisdom to themselves from days gone by. It’s a fascinating feature that gives us valuable insight into the lives of professional athletes, such as the fact that they all write in exactly the same voice. Even Brendan Shanahan did one. Man, it seems like it was only a year ago that you were just a wide-eyed kid, sitting around dreaming about going first overall in the entry draft and wondering where your NHL journey would begin. That’s because it was only a year ago. Look, don’t be a wiseass. This is why nobody likes teenagers. Anyway, the point is that I’m your older and wiser self, and I’m here to give you some good news. It all works out pretty well. It turns out you do go first overall at the draft, just like you’d always hoped. And that means you end up playing for the team that wins the lottery: The Toronto Maple Leafs. I know that comes as a surprise because you assumed that the whole thing was rigged so that only the Edmonton Oilers ever won, since that’s what Connor McDavid told you that one time you met him and he shook your hand while blinking “help me” in morse code. But nope… you’re going to be a Maple Leaf. That means you get to move to Toronto, which is a cool place. As best you can tell, the city’s baseball, basketball and soccer teams have always been really good, so there’s a lot of pressure on you to help the Maple Leafs get there too. But the whole town is really behind you. Everyone offers advice, from the cab drivers to the waiters to the hot dog vendors. Well, one hot dog vendor in particular. He keeps trying to hand you a note that he says is from “a friend” and which just has the word “RUN!” finger-painted in mustard. Still, I think that counts as being helpful. The 2016–17 Toronto Maple Leafs season has the team’s fans spewing the f-word. But for once, it’s the positive version: These guys are… fun. We don’t really know if they’re good yet. They’re certainly better than they’ve been in years, and probably far better than just about anyone predicted. They’re holding down a playoff spot, sure, but have also lost more games than they’ve won, so the jury’s still out. But fun? There’s really no debate. This year’s Leafs are young, fast and play high-event hockey, even when their coach doesn’t want them to. Love them or hate them, there may not be a team in the league right now that’s more entertaining to watch. Maple Leafs fans haven’t had many great teams to cheer on over the last half-century. The team hasn’t won a Stanley Cup since 1967, which is a fact that you might be familiar with if you’ve studied your history and/or ever spoken to anyone who doesn’t like the Leafs for more than three seconds. Since then, Leafs Nation hasn’t even had a trip to the final to cheer about. But when it comes to fun teams, Leafs fans have enjoyed a few. Not as many as other teams, maybe but enough to fill up an arbitrary list. So today, let's make that list, by counting down the top 10 fun Maple Leafs teams since that 1967 championship. The flip side is that when things are bad, you take whatever fun you can get. That's why this season cracks the list, if only barely. Sure, finishing third in your division in a lockout-shortened season isn't much to brag about. But when you've suffered through seven straight years without a playoff appearance, you'll take it. And this really was an entertaining team, one that had Phil Kessel doing Phil Kessel things, a breakout season by Nazim Kadri, strong goaltending from the perpetually chipper James Reimer, and a lineup full of face-punchers who were always doing face-punchy things. It all added up to a rare playoff berth. And despite going into their matchup with the Bruins as underdogs and falling behind 3–1 in the series, the Leafs scrapped back with a pair of hard-fought wins to force a seventh game. I PVR'ed that game and haven't watched it yet, so nobody tell me how it ends. A rare appearance on our list by a season from the 1980s comes from the only Leafs team of the decade to so much as finish .500. But this team was a sneakily entertaining entry, one that finished third in the league in both goals scored and goals allowed. They were still the Maple Leafs, so I don't need to tell you that it ended badly. They went out meekly in the first round of the playoffs, losing in five to the Blues in a series best remembered for Allan Bester giving up Sergei Momesso's overtime goal from outside the blueline. Far worse, this was the season that GM Floyd Smith decided it would be a good idea to trade a future first-round pick for journeyman defenceman Tom Kurvers, costing the team a shot at Eric Lindros and Scott Niedermayer. But there was a bright side. The season's breakout star was winger Gary Leeman, who became the second player in franchise history to score 50 goals. He'd never come close to that total again, but that temporary boost in value would pay big dividends for the team in a few years. With the Selke race wide open, who could emerge as the favorite? When it comes to handing out hardware at the NHL Awards, the Selke hasn't been all that tough to figure out in recent seasons. For the last five years, the same three players have dominated the voting. Patrice Bergeron, Anze Kopitar and Jonathan Toews have accounted for all five wins, as well as eleven of the fifteen finalist spots. But this year is shaping up like it could be different, with all three players slumping offensively. Maybe that shouldn't matter, since the Selke is supposed to be a defensive award. But over the years, it's morphed into a trophy that recognizes two-way play, which means you need to be scoring to get much consideration. If you pro-rate the lockout year, nobody has won the Selke with fewer than 55 points in the salary cap era. None of the Big Three are on pace to get there this year. With half a season left to play, that could still change. And it's always possible that in the absence of a slam dunk candidate emerging somewhere else, voters could opt to play it safe and go back to one of the old familiars. But for the first time in years, the Selke really does seem up for grabs. So who has a shot? Assuming that Bergeron, Toews or Kopitar don't take the trophy home this time, here are the five names that seem to have the best chance at stepping in. The case for: The veteran is having his best season since 2011, and is on pace for about 65 points while playing tough minutes for a first-place Ducks team. His advanced stats won't blow anyone away, but they're good enough that the analytics guys shouldn't push back too hard, and everyone loves a good comeback narrative. The case against: While it wouldn't be held against him by voters, Kesler doesn't really fit our "new blood" theme; he was the last player to win the award before the Bergeron/Toews/Kopitar trinity took over, and he finished third in the voting last year. More importantly, there's at least an argument to be made that linemate Andrew Cogliano deserves the award, too. If that line of thinking catches on, the two could end up splitting votes and knocking each other out of the running. The case for: While it's meant as a single-season award, voters tend to like to treat the Selke as more of a career achievement; it's rare for somebody to win the award without having built up a resume over the years. That works in Koivu's favor, as he's been considered a strong defensive forward for a decade now, finishing as high as fourth in the Selke voting back in 2009. He hasn't come especially close since, but he's had votes every year. New coach Bruce Boudreau has leaned heavily on Koivu in the defensive zone, and his ability to handle the duties has been a big part of Minnesota's unexpected success. With the Wild emerging as one of the one of the year's best surprises, voters will be paying attention. The case against: Koivu's all-around numbers are good but not great, and he's benefitting from a sky-high on-ice save percentage and PDO that's unlikely to continue. With Devan Dubnyk looking like the Vezina favorite and Boudreau having a shot at the Jack Adams, voters might figure that their ballots are already getting crowded with Wild names. Well, that game certainly took a turn. Last night’s showdown between the Penguins and Capitals already felt like a big deal going in. The two teams are very good, and Washington’s nine-game win streak had moved them past Pittsburgh and into first place overall. It was also a matchup between longtime rivals, not to mention a rematch of last year’s division final. What more could you want? Well, how about 15 goals? After a fairly ordinary first period that saw the Caps take a 2–0 lead into intermission, the two teams held down the turbo buttons for pretty much the entire second period, erupting for nine goals. They added three more in the third to send the game to overtime, where Pittsburgh’s Conor Sheary ended it just 34 seconds in. That's a lot to take in. So let's break it down, with a look at 10 of the more interesting facts from an interesting game. Washington became just the third team in the last two decades to score seven goals and lose. Seven-goal losses continued to be reasonably common through the early ’90s, right up until the arrival of the Dead Puck Era, when a 10–8 loss by the Penguins to the Sharks in 1996 marked the last time it would happen for well over a decade. That streak came to an end in 2010, when Philadelphia dropped an 8–7 decision to Tampa Bay. And those same Flyers were back at it a year later, losing a memorable 9–8 shootout to the Jets. The good news is that Murray picked up the win. The bad news is that he gave up seven goals while doing it. That makes him the first goaltender to give up that many in a win since Ondrej Pavelec, who surrendered seven in that Jets win over the Flyers. But Pavelec at least got a short break in that game, making way for Chris Mason to come in and give up one of the Flyer goals. To find the last goaltender who played an entire game and won despite giving up seven goals, you have to go all the way back to 1994 and a game involving, who else, the Flyers. On Feb. 21, they beat the Canadiens 8–7 behind the goaltending of Dominic Roussel. The funny thing about that game is that Roussel almost didn't make it to the end, because he nearly got ejected. After the Flyers' sixth goal, Montreal starter Patrick Roy decided to take a swing at Eric Lindros. That turned out to be a very bad idea, especially for Roy's unfortunate teammate, Eric Desjardins. Roussel skated the length of the ice to even the odds, but for one of the only times in Roy's career, cooler heads prevailed and the goalie fight didn't happen. - How do you rate star players across eras? - What's the deal with this year's weird scheduling? As of today, it’s been exactly three months since the NHL opened. On that night back in October, we all settled in to get our first glimpse of regular-season action, as the league took its initial steps towards the inevitable Lightning versus Stars matchup in the Stanley Cup final. OK, so not everything has turned out like we thought it would. (Fine — like I thought it would. Never listen to my predictions on anything.) But that uncertainty is a good thing; the league wouldn’t be any fun if we always knew what was coming. And it makes it worthwhile to occasionally take stock of where we stand as the season goes by. This is something we like to do around here about once a month. Sometimes, the trends end up sticking – back in November, we bought in on the leaguewide youth movement and the rise of the Metro Division, while in December it was time to go all-in on John Tortorella. Then again, back in the season’s first month it also looked like we could be in for a busy season of trading, and, well, we’ll get to how that turned out. So yes, markets can be volatile and you invest at your own risk. But you knew that already, so let’s get to this month’s stock watch. Now that we're past the halfway mark, it's becoming clear who the league's truly bad teams are. The Coyotes and Avalanche surely fit in that category, and the Islanders, Devils and Red Wings aren't far from joining them. But there's some good news for those teams: If this year is any indication, a stay in the league's basement doesn't have to be long-term. Here were last year's five worst teams, based on the standings: Calgary, Columbus, Vancouver, Edmonton and Toronto. Of those, three teams are holding down playoff spots right now – Columbus, Calgary and Edmonton. A fourth, the Maple Leafs, are on the outside based on total points but have played fewer games than most of the teams they're chasing, and would be in based on points percentage. And even the Canucks, written off early as the favourite to finish dead last, have been hanging around the playoff race thanks to a recent win streak. Granted, four of those five teams could still fall out of the race with a bad week or two. But the fact that they're even in the mix offers some hope to the Coyotes, Avalanche and friends. In a league where we still talk about five-year plans and slow and steady rebuilds, it's encouraging to see some evidence that a quick leap up the standings is possible. The Sabres went through years of misery, but it was the good kind: self-inflicted, and with a purpose. That purpose at least partially involved winning draft lotteries, and that part didn't work out so well, but there was still plenty of room for optimism. Last year brought progress, and set the stage for the year when it would all come together and the Sabres would finally contend for a playoff spot. It hasn't happened. Three months into the season, the Sabres are once again nestled towards the bottom of the Eastern Conference. Right now, they're on pace to finish with 84 points, which would barely be a step up from last year's 81. Sure, some of that is injuries, with key names like Jack Eichel, Evander Kane and Ryan O'Reilly missing time. But even with all those players back in the lineup, the Sabres have been largely spinning their wheels. And patience, which Sabres fans have supplied in abundance, may finally be running out. Nobody said this rebuild would be easy, and there's still time to right the ship this year. But watching the Sabres flounder yet again while fellow also-rans like the Blue Jackets, Oilers and Maple Leafs soar past them can't be anything but frustrating. These days, even the franchise-savior owner is losing some of his shine. Something has to give eventually. For the sake of some of the longest-suffering fans in the league, here's hoping it's a few wins. You may have noticed something unusual about the NHL schedule in recent weeks: Certain teams have disappeared, taking up to a week off at a time. That's thanks to the new bye weeks, a concept negotiated between the league and NHLPA last year that kicked in for the first time this month. The bye weeks – which are actually five days long, not a full week – are meant to give players on each team one league-mandated midseason break to rest and recharge. The idea borrows heavily from the NFL, which gives each team one week off during its 17-week schedule. But not everyone is a fan, with Toronto coach Mike Babcock calling the idea "100 percent wrong for player safety." So sure, the jury's still out on this one. But that doesn't mean the league shouldn't be thinking ahead to the next inspiration they could draw from the competition. So to give them a boost, here are five more ideas the league could steal borrow from the NFL. The big trade rumor in NFL circles these days doesn't involve a star player. Instead, it's a coach – New Orleans Saints' boss Sean Payton, who reportedly could be headed to the Rams. That's not all that rare in the NFL, where more than a few big-name coaches have been traded over the years, including Bill Parcells, Jon Gruden and Bill Belichick. It happens in the NBA and MLB as well – Blue Jays fans may remember the deal that sent John Farrell to the Red Sox a few years ago. The concept isn't completely unheard of in the NHL, but it's only happened once. That was in 1987, when the Nordiques sent Michel Bergeron to the Rangers for a first round pick. That deal didn't really work out for New York; Bergeron only lasted two seasons, never making the playoffs, and the deal ended up costing them the fifth overall pick. Maybe that's why we haven't seen a similar move since (aside from the forced draft pick compensation the league briefly implemented and then abandoned a few years ago). But it would be fun to see it come back. Jon Cooper for Claude Julien, WHO SAYS NO? Referees make mistakes. It happens. In fact, if you got fans of various sports together in a room, it probably wouldn't be long before they were arguing over whose officials were worse. It's the nature of fandom – we always think the guys in stripes have found a way to screw things up. But in the NFL, the league doesn't pretend that it never happens. The league reviews each game, and admits when the officials blew it. The league's head of officiating is also on Twitter, engaging fans with explanations of close or controversial plays. And if the refs miss one, someone explains what went wrong. It's certainly not a perfect system. Obviously, those admissions come too late to change the results, and are of little comfort to teams victimized by blown calls. (Some players aren't shy about expressing that sentiment.) And there's no doubt that some officials would prefer the league stayed silent, rather than hanging them out to dry. But the approach has one major benefit: credibility. When the time comes for the NFL to defend a call, they can at least point to other cases where they took the lumps. That creates at least a little bit of credibility in the eyes of fans, who don't assume that the league will just take a knee-jerk stance of defending everything. Compare that to the NHL approach, where everything is fine, and the league has virtually never seen a mistake that they've publicly acknowledged. That just creates an atmosphere where everyone thinks every close call that went against them was missed, and that every hare-brained conspiracy has some basis in reality. The NHL can't defend its officials effectively, because it never acknowledges when they do screw up. Nobody's perfect, and nobody should expect perfection from officials. But a little honesty from the league itself isn't too much to ask. We’ve hit the halfway mark in the NHL season, which means it’s time for another round of NHL awards. These aren’t necessarily predictions of who’s going to win what at the end of the year. Rather, we’re looking at who’d be taking home the honors if the season ended right now. Back in November, we did a first pass at these awards as teams were hitting the quarter-mark. But it’s fair to say that a lot has changed since then. We’ll include those awards here, if only as a reminder of how much things can shift in 20 games, and how much they’re likely to change again over the last half of the season. We’ll start things off the same way most successful GMs do: With star players in the crease. Hey, remember at the beginning of the season when scoring was way up and everyone got really excited and forgot that we're all supposed to pretend to like 3-1 games? That was a fun week or so. But ever since, the goalies are dominating again, just like they always do. It won't last—the NHL's slightly smaller equipment should be arriving any year now, you guys—but in the meantime, it makes picking the best of the bunch a challenge. At the quarter mark: We gave the nod to Tuukka Rask. That came with a bit of an asterisk, though—Carey Price was ruled ineligible since he'd already taken home MVP honors. Names worth considering now: Price. Rask. Sergei Bobrovsky. Corey Crawford. But the winner right now is...: Devan Dubnyk. The Wild goalie leads the league in save percentage and goals against average, and he's the main reason that the Wild have transformed from also-ran to somewhat surprising playoff lock. That might even earn him a Hart vote or two, but for now he'll be content with taking home our Halfway Vezina. The NHL's youth movement has been one of the dominant stories of the year, and it's not slowing down. This has a chance to be one of the best rookie classes in a generation. And that means there are fan bases out there that are going to lose their minds when their kid doesn't even get a Calder finalist spot. At the quarter mark: Patrik Laine took this one with relative ease; he was pushing for the league lead in goals and scoring at a 50-goal pace. Names worth considering now: Laine, although his recent concussion could obviously have an impact on the rest of his season. Zach Werenski. Mitch Marner. Brandon Carlo. Matthew Tkachuk. Ivan Provorov. And let's not forget Matt Murray, who many fans (and maybe a few voters) don't seem to realize is still Calder-eligible. But the winner right now is...: Auston Matthews. After enduring a 13-game goal-scoring slump earlier in the year, Matthews has caught fire, making up almost all of Laine's lead in the scoring race while holding down a more important position and playing almost entirely with other rookies. If Laine is healthy, it's still largely a tossup between the two top picks in the last year's draft. Unfortunately some Maple Leafs and Jets fans have decided to turn Matthews vs. Laine into a there-can-only-be-one showdown where trashing the other guy is more important than just appreciating the chance to see two elite rookies come into the league at once. We've got a decade or two of this to look forward to. Pace yourself, everyone. But yeah, for right now, the edge goes to Matthews. Give yourself a pat on the back, everyone. We’ve made it to the halfway mark. Well, some of us have. A few teams actually hit the midway point last week, while others arrived over the weekend. Others still have a few games to go, and won’t make it until the end of this week. The NHL schedule is weird this year. But still, enough teams are there that we can go ahead and say it's close enough. So we're halfway home. Great. What does that mean? For one, it means we should expect to see the standings start to solidify somewhat, as the constant churn of the early going gives way to something slightly more stable. There are still plenty of teams fighting for playoff spots, and three of the four division titles remain up for grabs. But we can at least start to draw some firm conclusions about the teams at the top. And while nobody's going to mathematically clinch anything for a while now, the top six or eight teams can already start looking ahead to the playoffs. Hitting the halfway mark also means that it's officially acceptable for teams at the bottom of the standings to throw in the towel. Struggling teams like the Avalanche, Coyotes and Islanders made it this far while still looking like they were trying, so nobody can accuse them of going full tank mode. But there comes a point where a good dose of realism can do a franchise some good, and any team that finds itself facing a double-digit playoff gap can safely throw in the towel any time now. And that leaves the third group of teams—the ones who are stumbling around in the middle of the standings, winning about as often as they're losing and bouncing in and out of a playoff spot. In the age of parity, that's going to be the biggest group, and there aren't enough post-season slots for everyone. That means it's time for pre-season favourites like the Lighting, Stars and Panthers to figure out exactly what they are, where they should realistically expect to end up, and what moves they need to make to get there. Early in the season—we're constantly reminded—is no time to panic. But once you've hit the halfway mark, time isn't on your side anymore, and it's time to stop kicking the can down the road and make some tough decisions. On that note, we're now just 50 days away from the trade deadline. With a tight playoff race and a looming expansion draft, it's going to be a tricky one for general managers to navigate. Some will find a way, and others will find excuses. Which category your favourite team's GM falls into may go a long way to determining how the rest of the season plays out. We'll be back tomorrow to hand out some mid-season mark awards. In the meantime, on to this week's power rankings. 5. New York Rangers (28-13-1, +38) – They're still tied for second in the Metro, but the Pens and Caps will finally get to make up some of those games in hand over the coming days as New York gets its bye week. 4. Chicago Blackhawks (25-12-5, +12 true goals differential*) – Coming out of the Winter Classic, the schedule served up four straight home games against non-playoff teams. So far, they're 3-0-0, moving back into top spot in the Central. - Does the Blue Jackets' shootout-aided win streak really count? Tonight, the Columbus Blue Jackets will try to make NHL history. With a win in Washington, they’ll tie the 1992–93 Penguins for the longest win streak the league has ever seen. It would be their seventeenth straight win, a stretch that dates all the way back to November. Nothing in that opening paragraph makes any sense. Really, go find a time machine and travel back to October and show that paragraph to the first hockey fan you find. They’ll have you committed. We’ve been trying to figure all this out for weeks without much success, but we know this much: This win streak isn’t just one of the best stories of the season—it’s one of the most unexpected stories of the last decade or two. So how did we get here? How did a team that nobody thought was much of a threat to even make the playoffs suddenly wind up in the same conversation as Mario Lemieux and Jaromir Jagr‘s mini-dynasty? How did a team that looked like a disaster early on manage to do something that the late-’70s Canadiens and mid-’80s Oilers never came close to? The only way to make any sense of it is to relive it. So today, let's go back through the Blue Jackets' last 16 games and try to figure out what happened. Setting the scene: Tampa comes to town one point up on Columbus in the hunt for one of the East's lower playoff spots. The Blue Jackets are overachieving at 11-5-4, but they've lost three of their last four to drop to fourth in the Metro. They're one point up on New Jersey. What happened: The Blue Jackets dominate, outshooting the Lightning 38–27 and pumping five goals past Andrei Vasilevskiy. Notable moment: Josh Anderson's third point of the night is an assist on a Scott Hartnell goal that makes it 4–0 and seals the easy win. Postgame quote: "It's fun to be around this team now in this locker room. I'm enjoying every moment." – Sergei Bobrovsky. May want to pace yourself a bit there, Sergei. What NHL fans were thinking: "Oh cool, the Predators won tonight. I bet those guys are ready to go on a run." Setting the scene: The Blue Jackets get a rematch against a team that had beaten them the week before. What happened: Columbus blows a 2–0 first-period lead, but gets a goal by Boone Jenner midway through the third to eke out a road win. Notable moment: Blake Comeau scores what looks like the tying goal with two minutes left, but it's waved off after a replay review. Postgame quote: "A lot of crazy things are going to happen during the year, as far as winning and losing." – John Tortorella. He wasn't wrong. What NHL fans were thinking: "Huh. I guess Tortorella might not be the first coach fired this year after all." Setting the scene: Columbus continues its tour through the bottom of the Western standings with a trip to Arizona. What happened: The Blue Jackets thoroughly dominate with 60 shots on goal, but Mike Smith nearly steals one. He makes a franchise-record 58 saves, but the Blue Jackets get the win in the shootout. Notable moment: The Blue Jackets get a 90-second 5-on-3 in the third period but can't score, which is basically like seeing Superman struggle to open a jar. Postgame quote: "I thought we stopped shooting the puck (in the second period)." – Tortorella. "I must have missed that part," replied Smith, probably. What NHL fans were thinking: "Wow, 60 shots? That's impressive. But let's see them do it against someone other than the Coyotes. Who's their next game against?" Setting the scene: In a rematch, the Blue Jackets return home in search of the franchise's 500th win. What happened: Sam Gagner has two goals and four points to erase an early Coyotes' lead, and the Blue Jackets cruise to an easy victory. Notable moment: The Coyotes challenge the third Blue Jackets' goal for goalie interference, but it's allowed to stand after review. Postgame quote: "We were a little sluggish early." – Gagner. He's either referring to the first period, or the franchise's first decade. What NHL fans were thinking: "Wait, why are the Coyotes and Blue Jackets playing a home-and-home? Everything OK, NHL schedule-maker? Anything you want to tell us?"